Since I’ve been disappointed with the overall performance of the Android stock web browser, I started using some of it’s competitors in order to discover if they were any better. Lately I’ve been using the Norwegian Opera Mobile which was recently updated to version 11.5. It has some cool features like Opera Turbo, that can be configured to only be activated when you’re not using WiFi, and allows you to save some bandwidth by compressing the web-pages, passing them through Opera own proxy servers, which is nice if you have limited traffic in your data plan. There is, however, “a price to pay” for this great performance: (lack of) stability! As you can see above, sometimes Opera Mobile crashes, which is kind of a common thing for me with Android devices, but not acceptable anyway. If Opera improves this, I believe this is one of the best browsers currently available for Android! This entry was posted on October 28, 2011 at 13:00 and is filed under Android, Opera, Samsung. You can follow any responses to this entry through the RSS 2.0 feed. You can leave a response, or trackback from your own site. 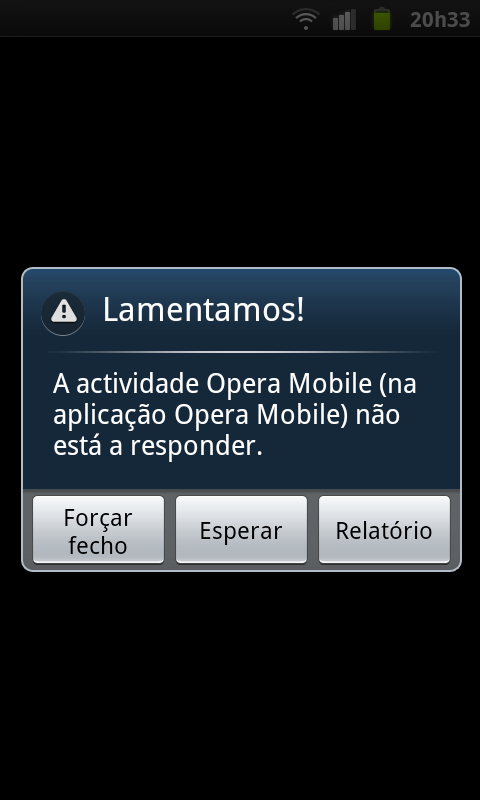 From seeing your other posts about the issues with the stock ROM, I think it’s not Opera Mobile’s fault that it’s unstable. Opera Mobile runs pretty stable on my phone. It’s a RAM hog, but it’s fast. 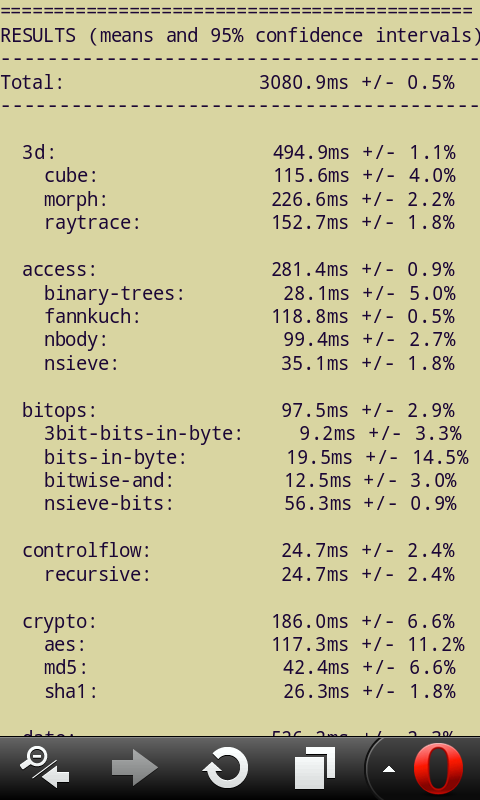 On my standard single-core device I get ~2000ms on SunSpider. Have you tried running a custom ROM, like CyanogenMod? You might break your warranty, so make sure you back everything up first before flashing it. See if that fixes your issues. Oh, and CyanogenMod supports proxies too, IIRC. I have to agree with you: the ROM quality might have some impact in the stability of the apps I run on the device. I posted this because with Opera Mobile, instead of simply crashing, the app stops responding and I have the option to wait for it or force close it, which is a little bit different compared with other crashes. I try to evaluate my experience with any product by using it just as the manufacturer intended it to be used. I prefer to formally complain with the manufacturer or carrier than try to solve by myself the problems they are being paid to solve.